We are your local concrete resurfacing experts! Concrete Resurfacing also known as Spray Paving and Spray on Concrete is the process of transforming an existing old or new concrete surface to a modern new surface at a fraction of what new concrete, pavers or tiles would cost. Concrete resurfacing can be applied to old or new concrete, pebblecrete, stenciled and stamped concrete and more. 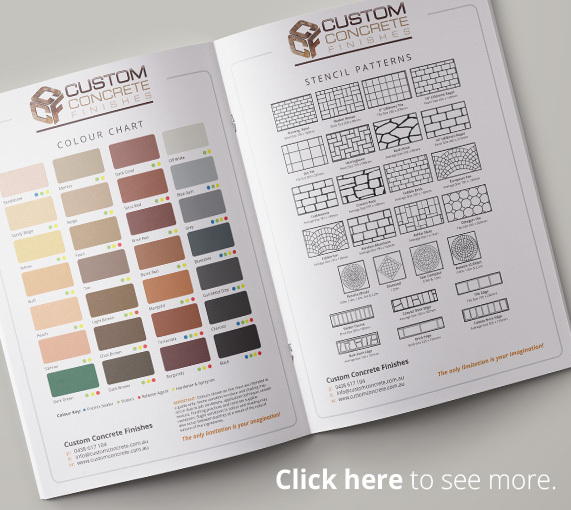 Our designs range from single colour textured finishes to standard classic patterns that will leave you amazed. Our patterns aim to lift the look, feel and value of your property giving it that that wow factor. Perfect for patio areas, entertaining guests will never be the same with one of our modern surfaces. When compared to the cost of replacing your concrete, tiling or laying pavers, concrete resurfacing is very economical and can save you thousands. We combine durability, attractive finishes, safe coatings, easy maintenance and more all in one price. Custom Concrete Finshes is an Albury Wodonga based family company, specialising in concrete resurfacing. Custom Concrete Finishes can assist where existing concrete is slippery or unsightly and requires a new look and safety – ideal for driveways, paths, decks, ramps verandahs, carports, patios pools etc. Established in 2003 we have already completed countless jobs across the country for domestic, commercial and government establishing a reliable reputation. We pride ourselves on the high standard of our finished projects; also by providing our customers with expert advice, project management, reliability & personal service. We are “The resurfacing experts”. Get Social – Like us on Facebook! Call us for a no obligation measure and quote. The latest products and news straight to your inbox!